I left Portland on Wednesday for this grand adventure called the International Reporting Project. Just getting out of town was an experience in itself, and Monday itself was particularly chaotic. I reluctantly decided to pack the 26″ rolling suitcase instead of my standard 19″ traveler. The 19″ can be rolled aboard aircraft, which means no checked baggage fees and no waiting around baggage claim post-flight. But there was really no way I’d be able to pack for three seasons (end of summer, fall, early winter) in that single suitcase even when supplemented by my computer backpack. So I pulled out the old 26″, which I don’t think has been used since I relocated to Portland in 2004. Let me tell you, that bag was pretty heavy. I limited myself rather severely on clothing and other supplies for the 9.5 weeks I’ll be away, but the weight still adds up fast. I’d planned to leave the house at 4 a.m., allowing enough time to deal with any potential traffic, make a stop at Voodoo Doughnut and still get to the airport well in advance of my 6 a.m. flight. Of course, being the nervous nellie that I am, I gave myself more time than necessary to get ready in the morning, so we departed a full 30 minutes early. Of course, there was no traffic, so we made it to Voodoo Doughnut by 3:45 a.m., and I found myself walking toward the airline counter shortly after 4 a.m.
Then I discovered my 26-incher was a pound overweight when I was checking in. I tried to figure out what I could possibly remove from my bag (and likely discard entirely, since my backpack was also full). Rummaging around in my suitcase, I pulled out a copy of “Rhythm” in order to look at what lay beneath. “That’s it,” the lady at the counter told me. “Just take that book out and your bag’s under 50 pounds.” As it so happens, I’d packed that copy of “Rhythm” to give away to a random stranger, so I signed the book to Lynda behind the counter, and she was delighted by the surprise gift. Of course, another airline employee tried to convince me that the only way I’d get my box of doughnuts through security was by handing it over to him. I got several such offers on the way to security and onto and off both flights. Nice try. 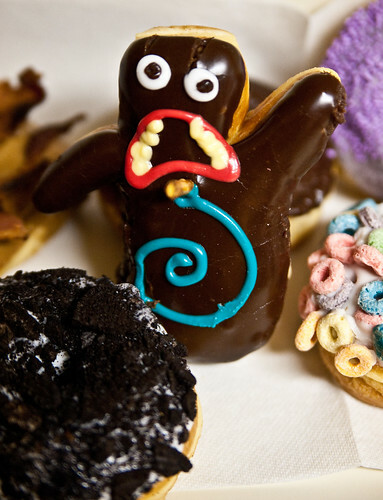 Those doughnuts were for my Dad, who’d just survived both an earthquake and Hurricane Irene but who’d never tasted a Voodoo Doughnut. No one was prying them away from me. Actually, an attendant on the first flight — after I’d explained what a Voodoo Doughnut is and why my pink box was so important — secured an entire overhead compartment just for my doughnuts even though the flight was oversold and completely packed. “No crushing the doughnuts!” she announced to my fellow passengers. The next day found me on the Greyhound from Richmond, Virginia, to Washington, D.C., followed by a lot of walking, a Metro train, and more walking — and when you’re carrying a full backpack and hauling a 50-pound rolling suitcase, that’s no small feat. Anyway, all ten fellows are now mostly settled in our IRP offices on Massachusetts Avenue. I have a lovely view out my office window of the dumpster behind the building, but there’s plenty of daylight and a nice view of the sky as well. My officemate is none other than Alex Gallafent who will travel to Swaziland in a couple of weeks to report on Pentecostal groups there. I know there are plenty more anecdotes to share, but my brain is still pretty addled from all the coming and going. More to come…. Posted in Ireland 2011, thoughts from the spiral. Glad you safely arrived and ready to start your adventure. Life has left me with little reading time, but I’m enjoying Valhalla. Looking forward to talking with you about it soon. Thanks, Tia! I hope all is well with you.